A great poet once said, "beef is what’s for dinner." But unfortunately that dinner can be wildly overpriced and not nearly as well-marbled as it could be. 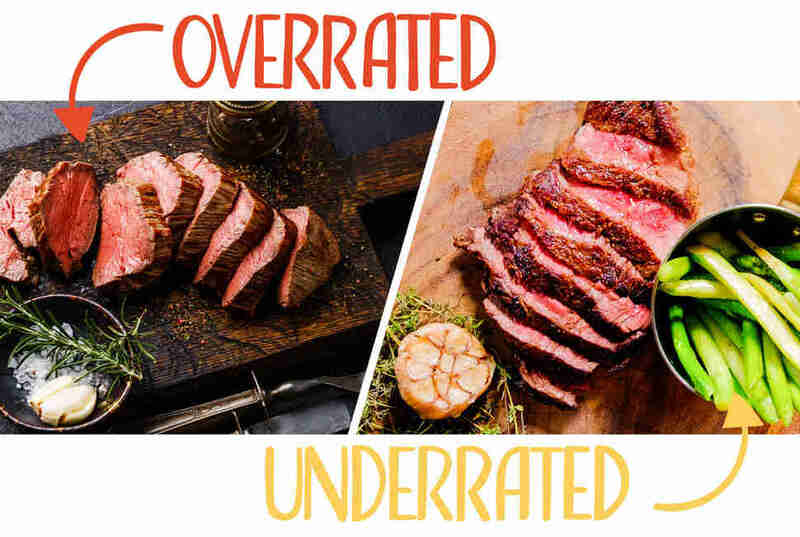 We hate to break it to you, but you’re likely ordering a cut of beef that’s totally overrated while overlooking another criminally cheap option (that still tastes great). 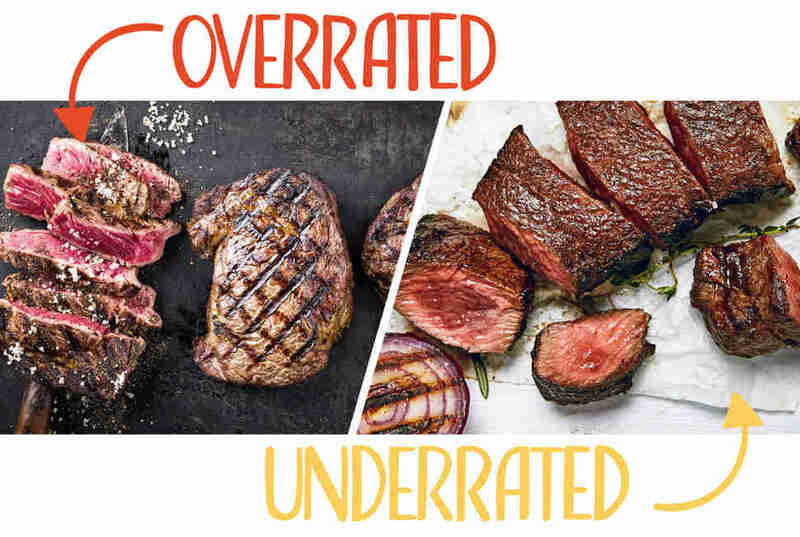 Thankfully, a group of chefs from around the country shared with us their secret cuts, under the condition that they also got to talk trash about filet mignon (and a couple other cuts, but mostly filet mignon). Spoiler alert: their answers were both rare and very well done. "It's flavorless and has no texture, yet for some reason people are willing to pay absurd amounts of money for it. I would never serve it in my restaurant." "You never see anyone use it, most likely because they don't know what to do with it, but if you slow braise the meat on the bone you can achieve a depth of flavor not easily paralleled by any other part of the animal." Anya Fernald, author of Home Cooked and co-founder of Belcampo Meat Co.
"My least-favorite cut is the tenderloin. It’s relatively bland and can be mushy. I like my meat with a little more substance, mouthfeel, and texture." "It's so easy and fast to cook, with great texture and flavor. I also love a hanger or a bavette steak for the same reason. A few minutes on each side in a scorching-hot cast-iron and dinner’s ready!" "It's been hangin' around every bistro for far too long." "Tri-tip, that larger, tender, triangular part from the bottom of a steer, isn't well known to most people. 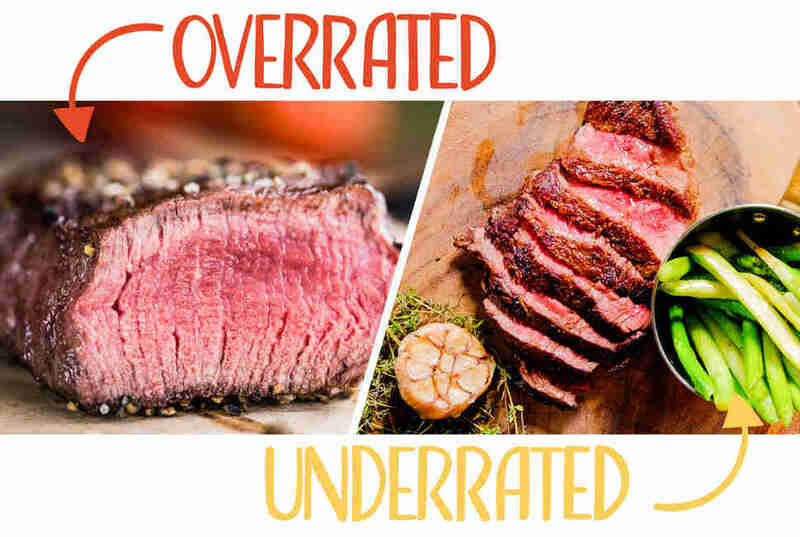 It is probably the least-expensive, best taste of beef you can purchase. There's not a lot of connective tissue, so it cooks very quickly and easily. It has been my go-to meat for grilling, it has a way of soaking in the wonderful flavors and allowed a slight caramelization on the outside." "I don't understand people's obsession with it. It has no fat and pretty much no flavor, and why is it so damn expensive?" "Trust me, this cut is where it's at. Marinate it overnight in olive oil with garlic and fresh herbs and then grill it hot and quick. You will never think about filet again." "I would say the most overrated cut of beef is the filet. While it is a tender cut, the marbling on a steak is really necessary in order to really get that rich taste and favor." "You have the tenderness of the filet and the flavor of the New York. It's also known as the butcher steak because the butchers used to keep it for themselves rather than sell it." "There's not enough fat for flavor and usually a safe bet for catering menus. The best thing about the beef tenderloin always tends to be the sauce, be it béarnaise or a red wine demi." 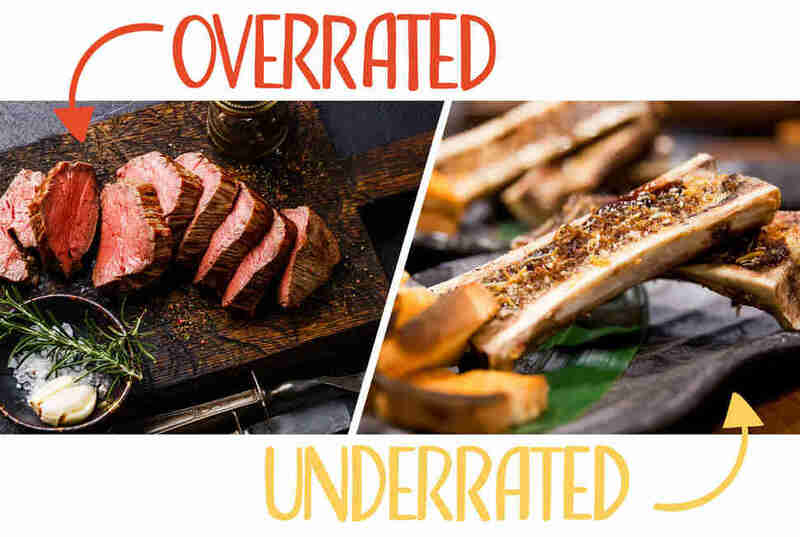 "One of the most underrated cuts of beef would have to be beef marrow bones. They are a classic, and the marrow is actually very good for you. Kings of England ate them every day and lived long lives! At Péché, we pair our marrow bones with pomme frites, a Vital Farms pasture-raised egg, and a drizzle of truffle oil -- sublime!" "t's prized for its tenderness but it has no flavor because there's no intramuscular fat." 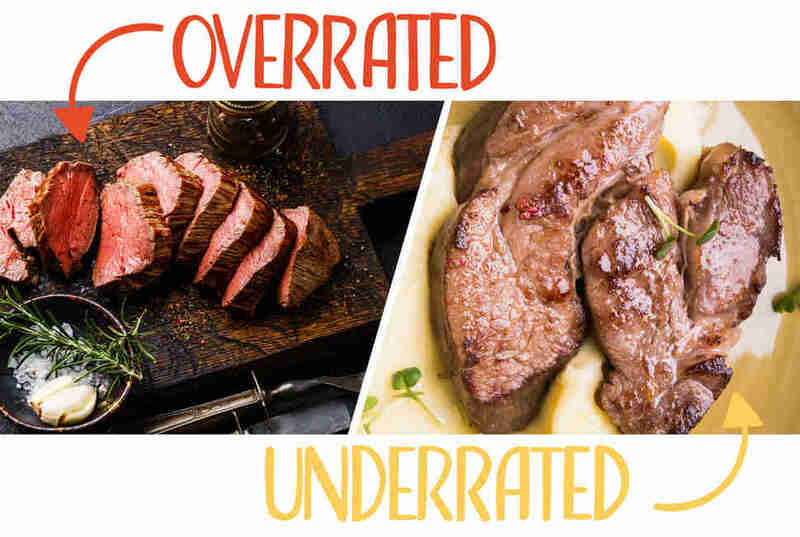 "The most underrated would be flap meat, or bavette. It has lots of flavor and it can't be overcooked. You've got to slice it against the grain, but it has a flavor and texture you can't find in other cuts." "This is a non-working, unused muscle that is prized for its tenderness. 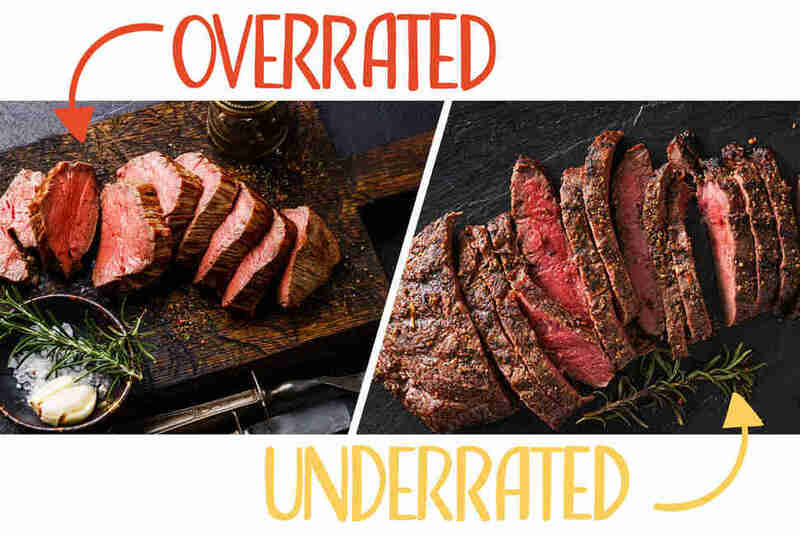 Unfortunately, tender is a one-hit wonder when it comes to steak because it is one-dimensional, flavorless, and downright boring. Serve it to me at a wedding and I'm fine, but don’t ask me to order and pay for it at a restaurant." "There are a couple of really wonderful underrated cuts of beef, starting with the hanger steak. The hanger steak comes from the plate, which is the lower belly of the animal, and literally 'hangs' from the diaphragm. You’ll find it to be rich and full with a hearty, beefy flavor, similar to that of a ribeye, but without the price tag. I also love any of the newly popular chuck steaks. Chuck refers to the shoulder and neck of the animal and yields some incredibly well-marbled and flavorful cuts, such as the Denver, flat iron, and shoulder petite tender cuts. 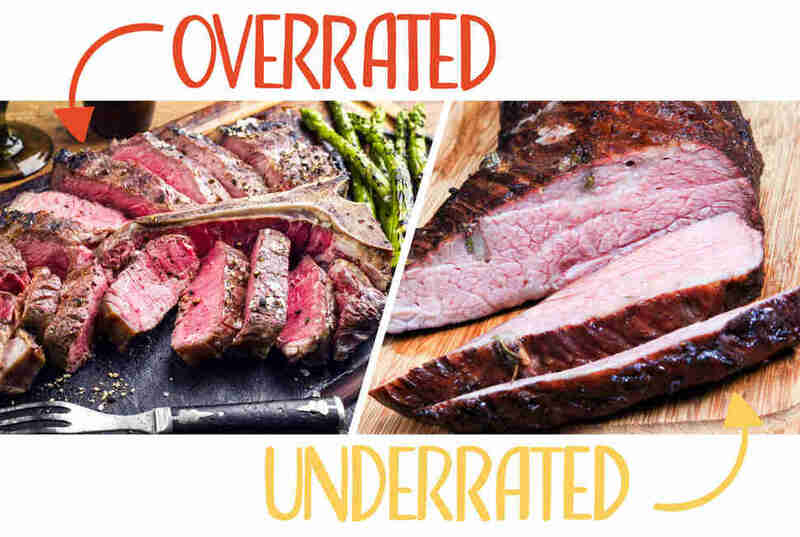 All three of these are incredibly supple and rival any of the more expensive and highly recognized cuts of meat." 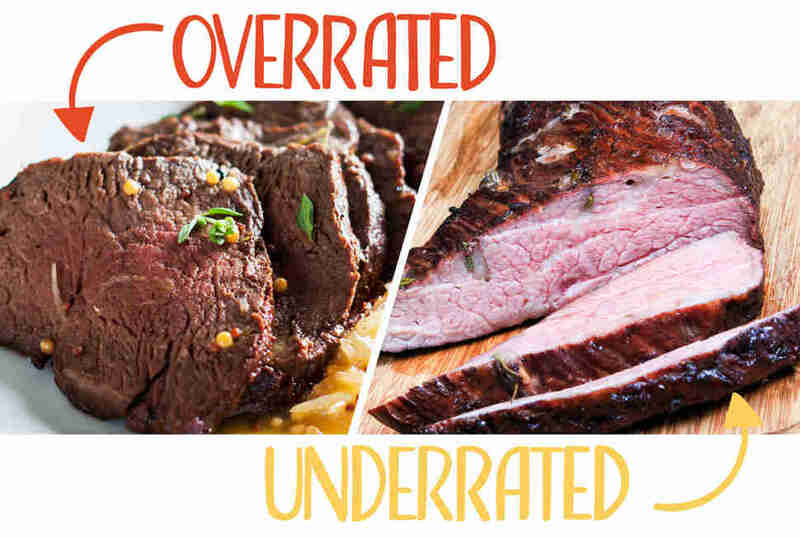 "To me, the most overrated cut of beef is tenderloin because it has no fat, little flavor, and tends to be very dry." "The most underrated cut is hanger because it hangs close to all the organs and all the blood, which gives it a lot of flavor and richness." "Filet mignon is the first obvious answer. Not much flavor or texture, and many of us chefs consider it the "beginner" steak. It's an easy sell and you can fetch a lot of money for it, but my biggest issue is that it's one of the lowest yields on a cow when there are so many other delicious options that you can cook up with much better results. "Also, I am tired of seeing 'Kobe' beef plastered on a lot of menus when in fact it is not true Kobe. There are a lot of ranchers raising beef with crossbred cows that have some of the Kobe lineage, but not the full strain. They are not raised the same way, yielding in beef that is far inferior to its Japanese identity. It's diluted and it's a shame." "The Denver is a really amazing and affordable cut. It's found on the chuck, is well-marbled, and has no connective tissues or fat caps to negotiate. 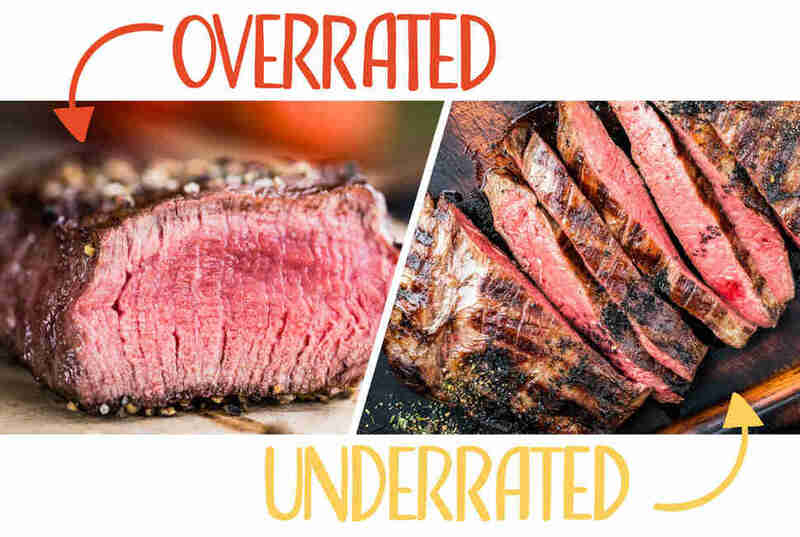 Just delicious, firm steak that can be grilled, roasted, or seared to a perfect medium-rare for about 25% of the cost of a "premium" cut of steak." "Comprising only about a pound and a half of a 900lb steer, this cut, while delicious, is best served infrequently and only bought from your local butcher shop. I love cuts like bavette, Santa Fe, and Denver in its place." "Let go of the notion that grassfed beef is lean, gamey, and stringy. Find a local producer or butcher that is touting the fattiness of their grassfed beef. An older animal with some nice marbling is going to blow any cornfed you’ve had out of the pasture. 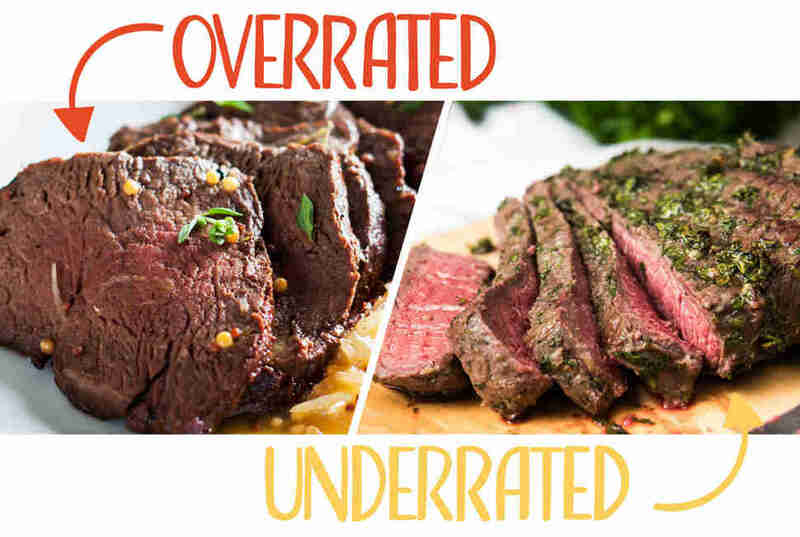 Test it out on cuts like flat iron, top sirloin, or even a London broil." "Undoubtedly, I think the fillet is the most tender piece of meat available, but it also has less flavor and there’s not enough fat content. Just like chicken breast, when cooked more than medium a fillet will become very dry, very quickly. It also tends to be the most expensive cut per pound. A fillet is definitely the last thing I’d ever order in a steakhouse." "In a good cut of hanger steak, there’s just the right of marbling and great flavor. I’d say the flavor is similar to that of a skirt steak. Even when cooked to well-done, hanger steak stays tender and juicy -- just what a great steak should be. Plus, the price per pound is reasonable." 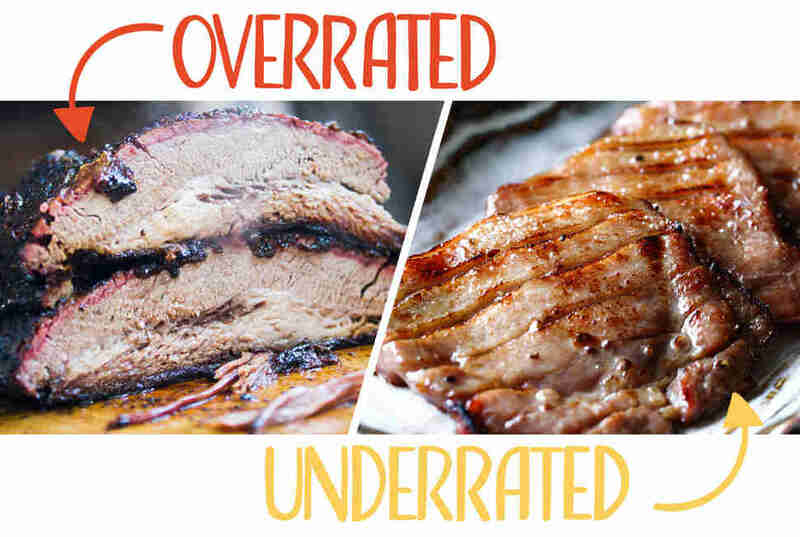 "Brisket itself is not overrated because it, like Texas barbecue, it’s eternal. But the mystery around cooking it is way overhyped. It used to be that cooking a brisket correctly (tender, juicy, smoky) was some difficult feat, now it is expected for barbecue joints to open on day one with excellent brisket. Every barbecue joint with a good reputation has not only figured out how cook brisket well, but how to do it in quantity." "Just as fatty, beefy, and delicious as short ribs, it’s just hard to get regular people over the fact that they’re eating tongue." "For me the most overrated cut of beef is the porterhouse as it seems like the steak for the person who couldn't make up their mind. It also needs to be cooked very carefully because of the nature of the two cuts: filet and strip." "Recently I was at Texas A&M University discussing beef and its different cuts, and one of the cuts that stuck with me was the tri-tip. As it turns out, this cut is so popular in California (and not so popular here) that a lot of Texas tri-tips end up being shipped there and in return we get a lot of their briskets. 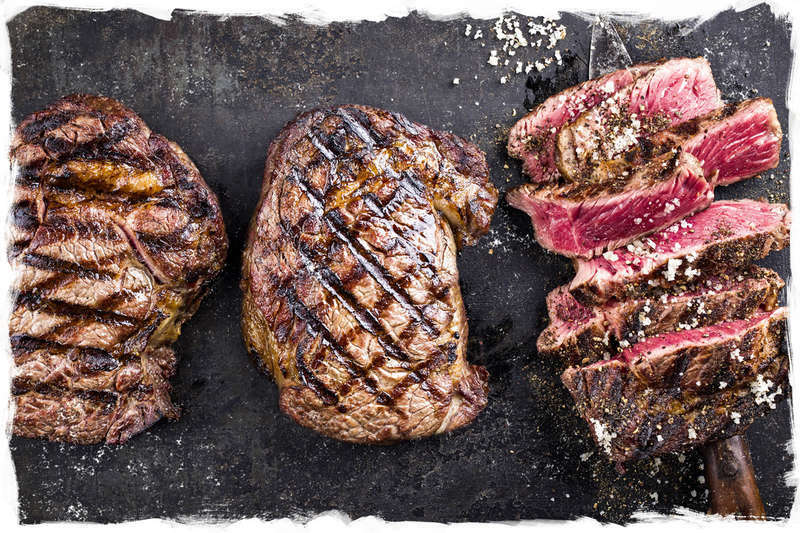 A good marinade and cooked to medium-rare on the grill, and you have a nice sliceable steak to pair with a little chimichurri and a good malbec." 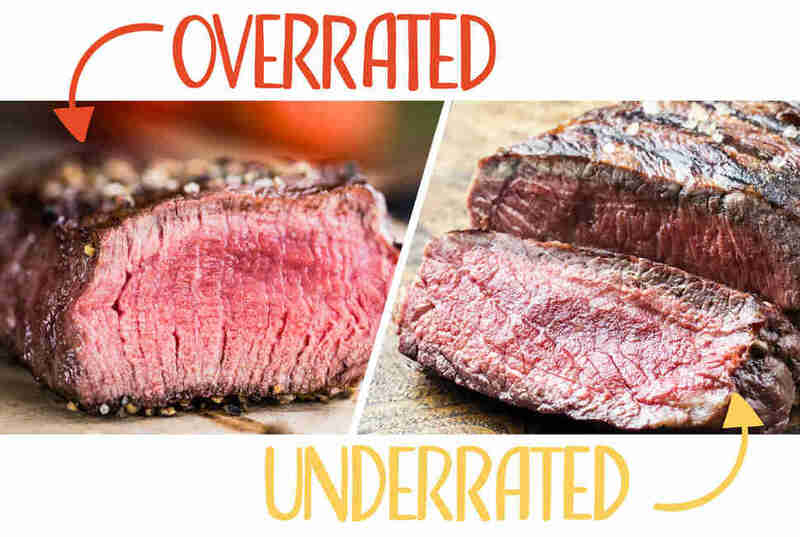 "It's known for tenderness, yet that's because it comes from an underused muscle in the cow, and therefore it doesn't develop the depth of flavor you'd want from a cut of meat at that price point." "It's an off-cut that can be cooked just like a steak, but it's from a lean, muscular part of the cow, so it carries rich, beefy flavors while still retaining a fair amount of tenderness." Dan Gentile is a former staff writer at Thrillist. He eats beef tenderloin every Christmas and doesn't plan to stop anytime soon. Follow him to his parents' house at @Dannosphere.